"What is it about travel that you love?" I remember vividly the first time I was asked this question. I had no idea this question, which was asked in a very casual manner would end up changing my life forever. For, as I started to ponder about it, I realized, it is not only travel that I loved so much but also how I travelled, and the total experience of it all. 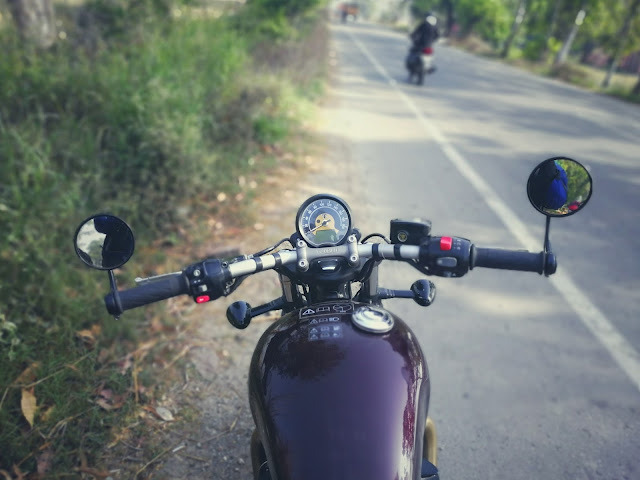 Motorcycles have always tugged at my heart-strings and it is no secret then, whenever the word "travel" is uttered, I always get excited at the prospect of travelling on 2-wheels. So, when this opportunity knocked on my door-steps (quite literally! ), I could NOT have said no for an answer. The motorcycles of choice, you ask? Well, a Triumph Street Triple S & the indomitable Triumph Bobber! Yes, I know what you're thinking. With a motorcycle like Bobber that seems ghastly impractical to tour on, how the heck could one take that bike on a trip to the Himalayas. Agreed, with no luggage carrying capacity (except a magnetic tank-bag mounted on the fuel-tank), a tank which is just 9-litres and a seating posture which isn't ideal for anything more than a short ride to your next door coffee-shop, the Bobber is meant for touring. But, I am glad we decided to stick to the Bobber. You see, we couldn't find much information online when it came to touring on the Bobber, atleast in this country. 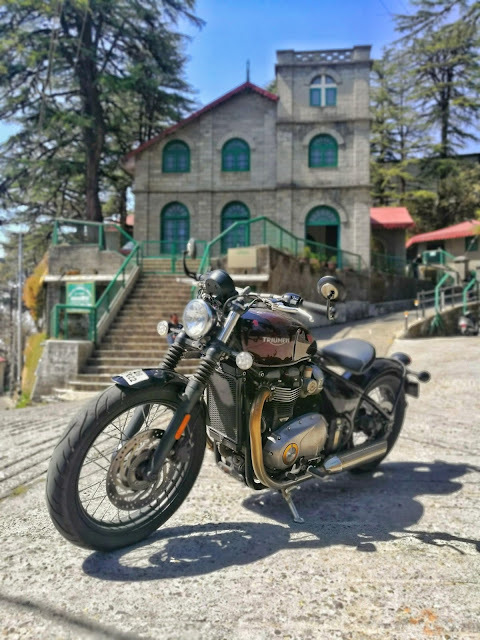 So, it was obvious that our inquisitive selves were only more excited when we thought of riding the Bobber to the mountains. 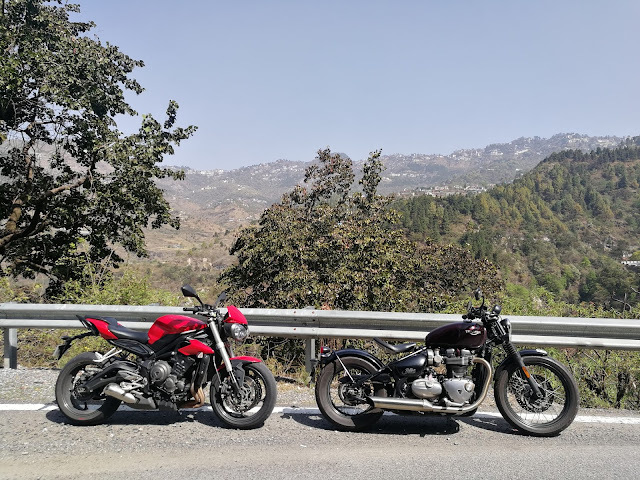 So, on a rather warm morning, we, with the two motorcycles left for the hills of Mussoorie. Riding through the well-paved, wide NH-1 was such a pleasure on both the bikes. 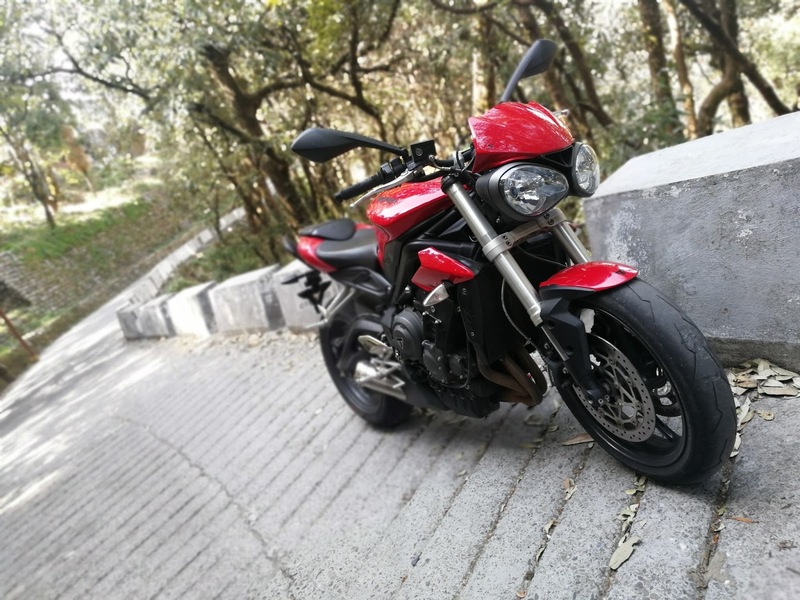 While the Street Triple is more of a hooligan bike meant for revving high and doing the related shenanigans, the Bobber is just meant for a relaxed cruising. It doesn't have the urgency that other motorcycles might have, but that does not mean, it is lazy or slow for that matter. Cruising at an extremely relaxed 120km/hr., you twist the right wrist and the Bobber leaps ahead with the urgency of a cannon. It pushes you back on that single seat in a way like you do not expect and pulls like a locomotive. That massive torque curve is phenomenal & all 107Nm of it comes at an extremely low 3,500RPMs or thereabouts. One little gripe which was rather expected of the Bobber is that suspension setup. It feels like non-existent and the Bobber makes sure that the rider feels every small pebble that the motorcycle goes over. So, it did get a little uncomfortable after a while and hence we made sure we took quite a lot of breaks in between before finally hitting our destination o the day - Dehradun. Now, the city of Dehradun isn't your average hill city. It is rather a full-blown big city with all the major amenities & luxuries of life that you would expect. But, I am sure of one thing - ours was the only Triumph Bobber on the road that day, for it gathered hundreds of eyeballs no matter where we took the motorcycle. Be it little kids, young adults or senior citizens, people just could NOT get enough of the motorcycle. That is the kind of style-statement that the Bobber has. 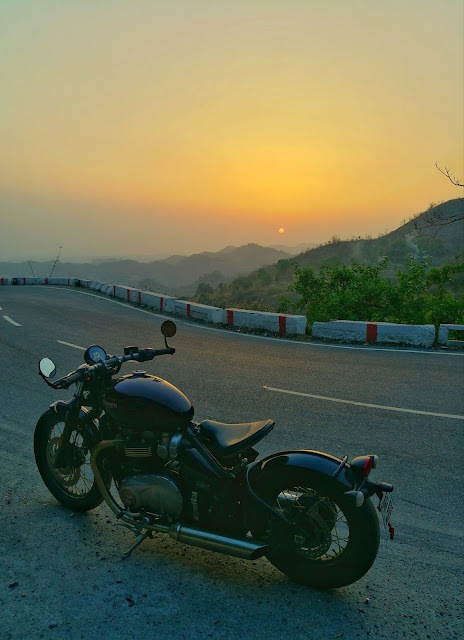 After a fairly long ride of about 370-380kms from Delhi to Dehradun, we called it a day with some great experiences enroute on the Bobber as well as the Street Triple. 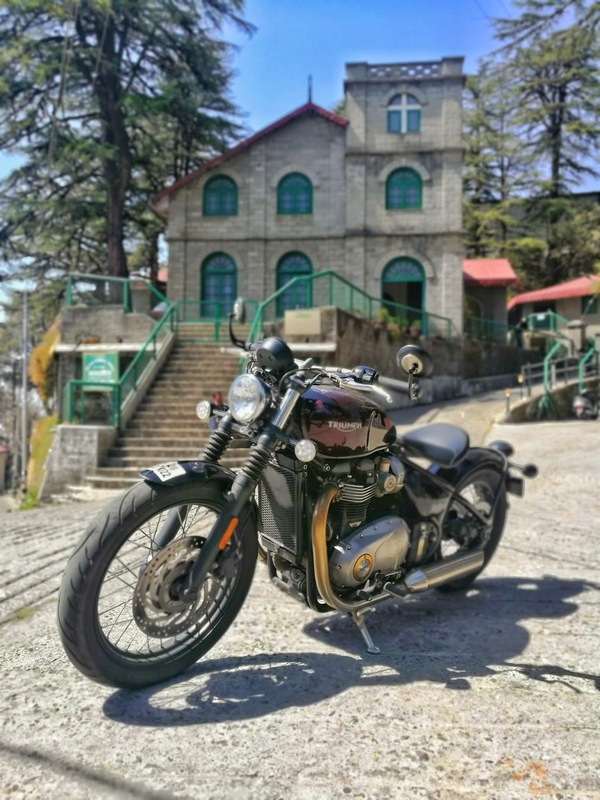 Deep down in our hearts we knew that the next day is going to be an even more exciting one as we were to ride to Mussoorie & Landour on these two beauties. Now, when adrenaline pumps through your veins, it gets tough to sleep for long. So, it wasn't even 6 in the morning and both of us were up and raring to leave the hotel premises. But our local boy who was to guide us to different locations was pretty late & hence we only started riding on this day well past 9 in the morning! 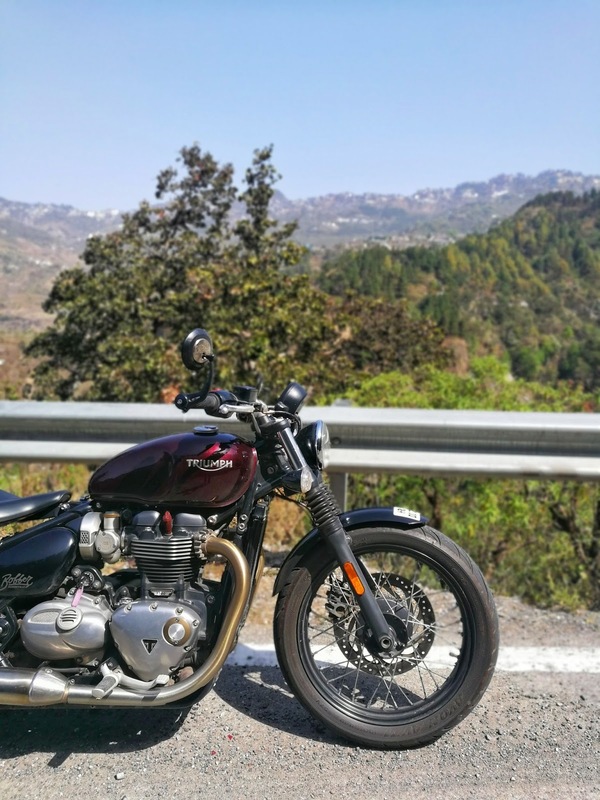 But, we did not have much to ride, really, as all we wanted to do was ride to the beautiful small Landour, take some pictures, relax and just generally be. To that end, the Bobber & even the Street Triple performed brilliantly. The Bobber was a pleasure to ride around corners. I didn't think it'd be this easy to maneuver the behemoth given how long of a wheelbase the motorcycle has, but boy, did I enjoy the ride on the Bobber or what! 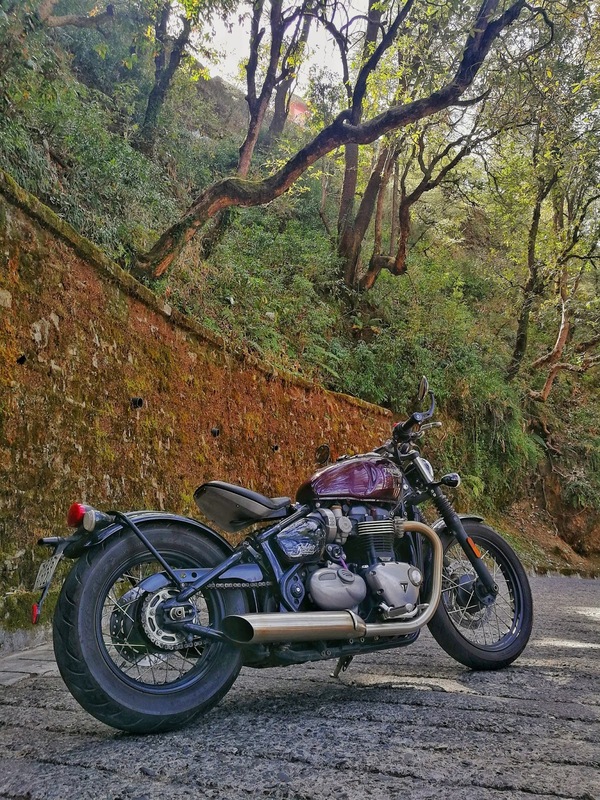 Be it the long flowing twisties or the bylanes of the market, the Triumph Bobber handled it all really well. We stopped at some picturesque locations, took photographs, answered the many queries that the bystanders and passer-by had and moved on. After a satisfying day's ride, it was time to return to the comfort of our hotel room. As I contemplated on my ride on the Bobber, I could not help but think what pre-conceived notions I had. I had thought that the Bobber might not be a motorcycle to ride long-distances on, and will be a pain to ride on the hills. But, it all turned out to be so different. Ofcourse, you cannot take the motorcycle touring every weekend, and you will definitely not take the Bobber touring for a 500kms. ride but every once in a while, I feel, the Bobber will be a fantastic machine to cruise on. Agreed, with zero luggage carrying capacity and a fuel tank which is just a shade over 9 litres, it will be a little bit of a stretch, but I was carrying enough luggage for a 3 day trip on a Cramster tank-bag which was a perfect fit on the tank. Also, with a consistent fuel economy of over 24km/litre from that behemoth of an engine (1200cc), I was pretty confident when it came to the overall range of the Bobber. I got to learn a lot from this ride, really. 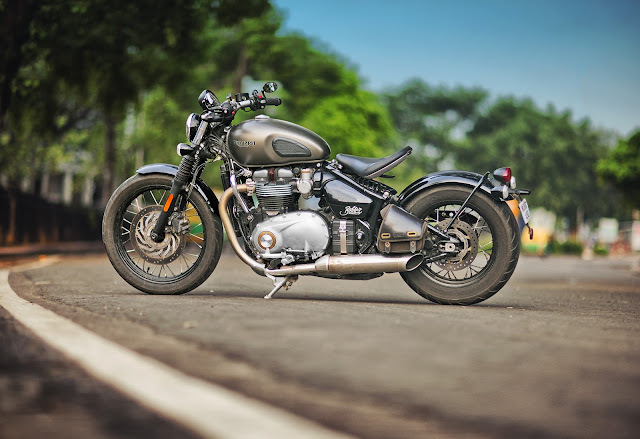 Things that I thought weren't really possible were easily made possible and today if you ask me about my thoughts on the Triumph Bobber, you'd find a completely changed person altogether. For, I think, there are a few things in life which you need to spend time with before being judgemental about it. And the Triumph Bobber is definitely on top of that famed list.